FERRARIO -[ Tunguses leaving their winter encampment ]. FERRARIO, G. - [ Tunguses leaving their winter encampment ]. [ Tunguses leaving their winter encampment ]. - FERRARIO, G.
Title : [ Tunguses leaving their winter encampment ].. 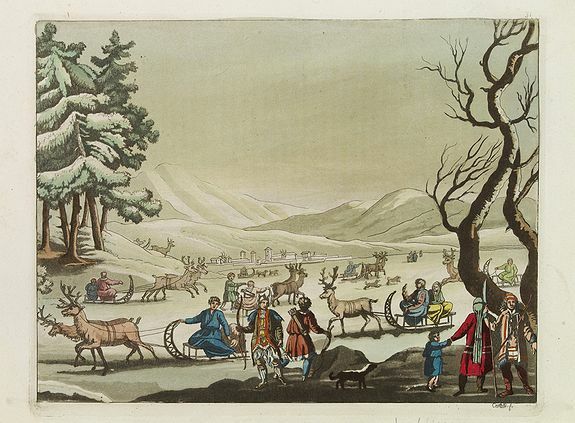 Description :Aquatint depicting Tunguses leaving their winter encampment engraved by Castelli, after drawings by C. Bottigella. The Tungses people are a group of roving Turanian tribes occupying Eastern Siberia and the Amoor valley. They resemble the Mongols. The Tungsens ancestors having come to Kamchatka changed their traditional occupation hunting for reindeer breeding. The complete set of a man's wear consisted of a short knee-reaching reindeer parka with running down lapels, trousers, a chest apron put on the parka, knee protectors, fur stockings and boots made of reindeer led skin with soles of bearded seal skin. The Tungses did not use dogsleds. Plate N° 31. From Giulio Ferrario's work Le Costume Ancien et Moderne ou Histoire du gouvernement, de la milice, de la religion, des arts, sciences et usages de tous les peuples anciens et modernes d'après les monuments de l'antiquité et accompagné de dessins analogues au sujet par le Docteur Jules Ferrario. ".